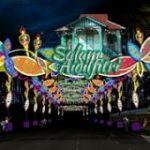 The annual Hari Raya Light Up 2017 in Singapore will return to Geylang Serai from 20 May to 7 July 2017, to delight local and international visitors with a visual extravaganza comprising over 900,000 LED light bulbs, and a month-long shopping fiesta. Over seven weeks, visitors will be treated to a visual feast of larger-than-life light installations modelled in the likeness of traditional Malay heritage icons. 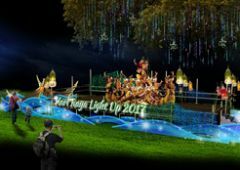 Located along Sims Avenue and Changi Road, the centerpieces of Hari Raya Light Up 2017 will incorporate a kampung, as if welcoming visitors into a traditional Malay home of yesteryear. This will be complemented by leaf motifs designed like songket, a traditional Malay fabric made of hand-woven patterns. 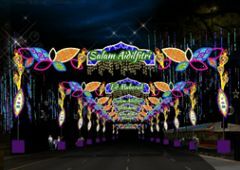 Additionally, other arches will feature words of blessings that Muslims often use during the holy month. 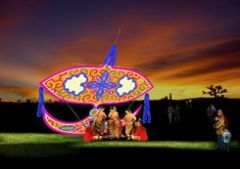 Other gigantic installations include a 4.4-metre tall wau (Kelantanese kite) which allows the curious to learn about the richness and diversity of Malay arts and culture, and a 12-metre wide kelong (offshore platform made of wood) and sampan (fishing boat) that will form the main stage area for weekly performances and movie screenings. Visitors will also get a blast from the past, in the form of a pop-up museum showcasing gongs, fishing boats, weaponry used by Malay nobles and traditional Malay games.